1. In a thrilling four-corner scramble match, the debuting KTB (aka Kyle the Beast) pinned Mark Wheeler, also scoring the win over the also-debuting Matt Knicks and Stevie Fierce. 2. Brute Van Slyke continued to praise to “Old School” as he defeated Space Monkey. Monkey, still recovering from an injury, stood no chance as he tried to compete with the larger Brute. 3. In a high-flying six man tag team match, Fight or Flight (Vaughn Vertigo & Gabriel Fuerza) along with Justin Saikaley defeated High N’ Mighty (Jonathan Rukin & Velvet Jones) and “The Curse” Cecil Nyx. During the course of the match-up, Velvet tried to calm Nyx’s over aggressive nature by “natural” means… This backfired, and directly lead to Nyx being pinned, and suffering a broken tooth in the process. Nyx has not been seen or heard from, by C*4 management, since this strange turn of events. 4. Stu Grayson narrowly beat the debuting Josh Briggs. The near 7-foot tall Briggs made a big impression on both the C*4 fans, and his opponent, managing to go move for move with the former Champion. Despite the loss, it is clear that C*4 has not seen the last of Briggs. 5. In spectacular tag team encounter, LAX (Santana and Ortiz) managed to overcome the debuting-as-a-team in C*4, Monster Mafia (Josh Alexander and Ethan Page). Both teams gave a clinic in tag team competition, and at many times it could have gone either way. 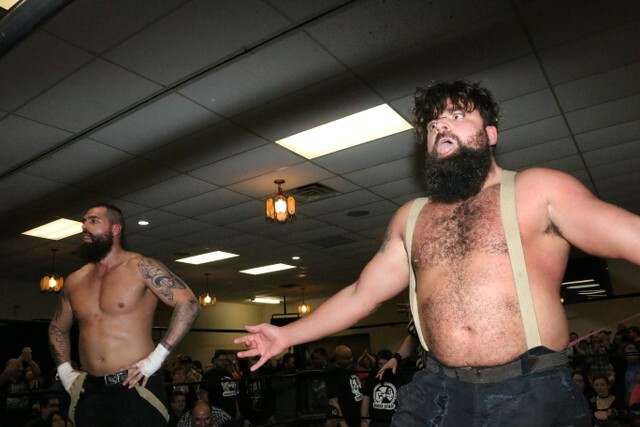 In the end, LAX showed why they are one of the top tag teams in the world, and continued their winning ways. 6. In a violent and hard-hitting tag team encounter, C*4 Tag Team Champions, Heavy Metal Chaos, (James Stone and Alextreme) managed to survive their match against the returning Doom Patrol, (Chris Dickinson and JAKA). 7. Following the next match, “MVP” Michael Von Payton addressed the audience, and revealed that Brent Banks would not be competing against him. Von Payton addressed the audience and specifically members of the ring crew and event staff. He said that they were all their watching the show, and dreaming to be in the ring on a show. Von Payton set his sights on a young man sitting by the audio table. He invited him in the ring. Von Payton asked the young man his name, and where he was from. The young man revealed his name to be Sheldon Jean, from Ottawa. In questioning why he had never heard of Sheldon, it was revealed that the rookie had trained in Windsor, Ontario, under Scott D’Amore. Von Payton told him that the match was on, and gave Sheldon a chance of a lifetime. In one of the biggest shockers to ever take place at 260 McArthur Ave, Sheldon Jean managed to score a pin on the near 20 year vet, Von Payton. 8 . Following the next match, Vanessa Kraven made her way to the ring, as it was revealed that she would be challenging Marcedes Martinez at the upcoming Femmes Fatales 20 event in February. Upon making her way to the ring, Twiggy came out, and began to berate Kraven. This lead to C*4 Champion, “Diamond Tiger” Kobe Durst hitting the ring to get in the face of Kraven, which lead to their battle for the Championship to begin. Kraven seemed to have Kobe defeated several times, until Evil UNO hit the ring. Uno sprayed mist into the eyes of Kraven, allowing her to be pinned by Kobe. After the match “The Beast King” FTM made his way to the ring, who along with Uno, began to assault Kraven. A moment later Tabarnak De Team stormed the ring. 9. In an absolutely wild brawl, Mathieu St. Jacques and Thomas Dubois managed to defeat Uno and FTM. After the match, a brawl between everybody continued, until Stu Grayson and Vanessa Kraven hit the ring, aligning themselves with TDT, to clear the ring, and stand tall. C*4 returns to action Saturday March 17th, 2018, when we present “THE DEPARTED”, featuring the debut of third-generation international superstar, TEDDY HART! Before then, C*4 is excited to welcome and host Canada’s premiere all-female wrestling promotion, FEMMES FATALES, as they present FF20! ← #C4InTheMoutOfMadness – Full card revealed! Three more high-intensity matches set!